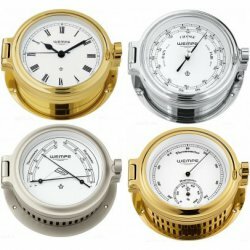 The exclusive WEMPE CUP Series in porthole design is comprised of a battery-powered quartz clock, a barometer, a comfortmeter, and a combination of both thermometer and hygrometer to measure temperature and relative humidity with one instrument. The housing surfaces are available in many designs: The products of the CUP Series can be ordered in polished brass that is colourlessly lacquered, in highly polished chrome, or matt nickel plated. The porthole ship clocks are manufactured with Roman or Arabic numerals on the clock face. With their toggle clasps all WEMPE CUP instruments can be easily opened and closed for switching batteries or readjustment. All marine instruments of this series are 140mm in diameter with a 100mm white clock face. Bring a masterpiece of nautical instrument manufacturing on board or place a WEMPE CUP instrument as a real highlight in your office.